In Mexico “capear” or coat something in egg is very popular, we use this technique with a lot of vegetables, there is even a very famous dish, “Chiles en Nogada” that, traditionally, the poblano peppers are coated in egg first and then cover with a nutty sauce. In this recipe I am using spinach, they are a bit fiddly to work with, but once they are coated, they are totally fine. 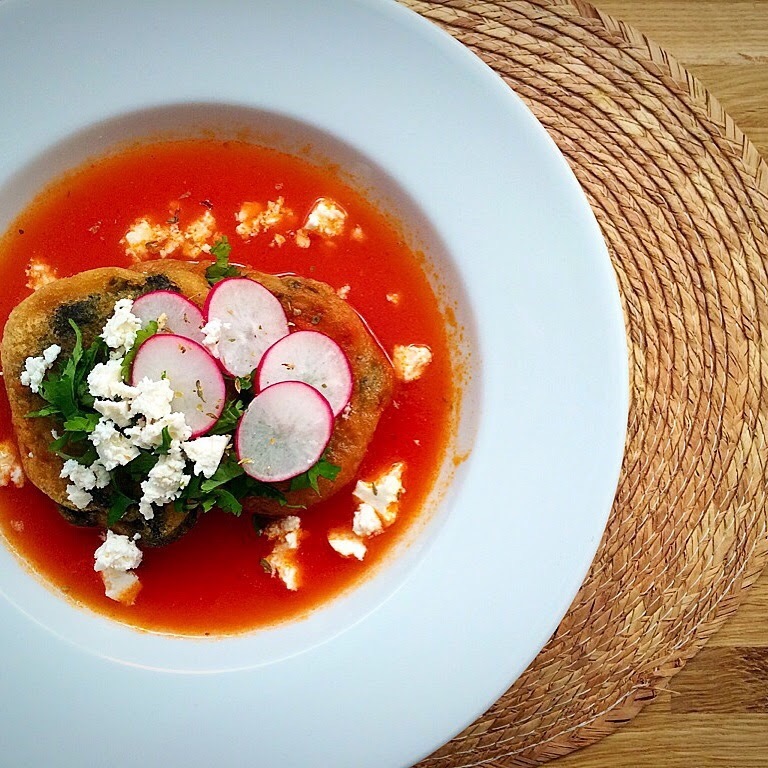 The tortitas can be eaten with a tomato consommé and fresh cheese. Give them a try and you’ll see you will love it. Prepare the tomato consommé and then start with the spinach patties. Cook the spinach in a steam, it takes around 10 min, remove them from the steamer and squeeze them to drain the excess of water. Make little balls of spinach and set aside. Beat the eggs whites to soft peaks and then add the egg yolks one by one and continue beating, until egg whites and yolks are combined. In the meantime heat the oil on a frying pan. Cover one spinach pattie some flour, removing the excess, the cover it with the egg mixture and introduce it to the hot oil, fry it on each side for 3 min and do the same procedure with all the patties until they are all cooked. Have two tortitas in a bowl and some consommé, garnish them with radish slices, fresh cheese and chopped coriander. Me encantan cualquier clase de tortita Karla. La gente que no a probado tortitas en caldillo, consomme o salsa no saben de lo que se pierden! Ja ja! Sooo delicious!